Spring training has come to an end, and part of that is the finalizing of rosters. The biggest news was that Grady Sizemore won the center field job, and in turn Jackie Bradley (pictured, right) was optioned to Pawtucket along with two other players with major league experience, Drake Britton and Ryan Lavarnway as SoxProspects.com Senior Staff Writer John Gray writes. Bradley says being sent down is “humbling” as ESPNBoston's Gordon Edes notes, and Bradley tells WEEI's Alex Speier that his approach is not where he wants it to be right now. Final major league roster cuts were announced on Saturday, and while some roster cuts were announced, Brandon Workman was not among them. 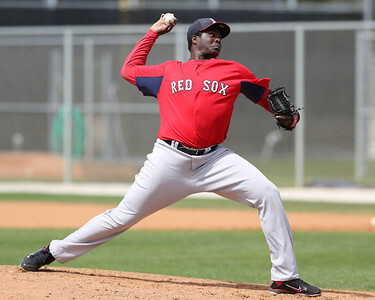 SoxProspects.com Staff Writer James Dunne writes will be a part of the Red Sox bullpen to start the season and Brian MacPherson of the Providence Journal writes that he has shown more consistency. David Dorsey of ESPNBoston has Workman's reaction saying, "it feels great...I feel really confident. I feel like every outing, I've gotten a little bit better." 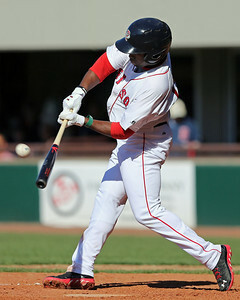 Take a look at the SoxProspects.com Team Rosters page to see the latest roster updates for all of the Red Sox affiliates. Former 2010 first-round pick Kobrin Vitek announced his retirement this week and James Dunne sums up his time as a Red Sox. Peter Abraham of the Boston Globe has the news out of Arizona this week that outfielder Ryan Kalish, former Red Sox prospect, learned that he has made the Chicago Cubs. Third baseman Michael Almanzar was taken in the Rule 5 Draft this off-season by the Baltimore Orioles, and in order to keep him they needed to keep Almanzar on their active roster all season. However, he was placed on the 15-day DL last week, thus delaying the process. One he is removed from the DL, he must be put back on the 25-man roster and remain there all sesason or be offered back to the Red Sox. The SoxProspects.com staff had a great week down at Fort Myers, and content from that trip continues to pour out. Director of Scouting Ian Cundall had the chance to see a lot of young pitchers and covers many from the Low-A and short-season games in his latest edition of scouting scratch. Meanwhile left-hander Cody Kukuk is a player that has impressed during spring training, and Managing Editor Matt Huegel writes how he is trying to turn a weakness into a strength. Executive Editor Chris Hatfield wraps up the SoxProspects.com’s trip to Fort Myers with dispatches from the Fort. ESPNBoston had a five part series highlighting the Red Sox system depth by position groups written by SoxProspects.com Editor-in-Chief Mike Andrews. This week in part four Mike highlights the lack of corner infield depth and in part five he covers the outfield depth in the organization. Xander Bogaerts is getting ready to play in his first Opening Day with the Red Sox. Bogaerts' roots in Aruba were humble writes Stan Grossfeld for the Boston Globe. Alex Speier talks with Bogaerts about long-term deals and following in the footsteps players like David Ortiz and Dustin Pedroia. 22-year old Simon Mercedes (pictured, left) dazzled earlier this week and Alex Speier took notice. After hitting 100 earlier this spring, Mercedes sat 95-96 in the outing, and also threw a changeup and curve. Allen Webster had a rough start this week, allowing five runs in 5 ⅔ innings, bringing his spring ERA to 6.11. The Providence Journal's Brian MacPherson has quotes from manager John Farrell who talks about the struggles of young strikeout pitchers and that these struggles are often part of the learning process. MacPherson also writes that a surprise championship won’t change the Red Sox long term plans. Finally, yesterday Editor-in-Chief Mike Andrews released word out of SoxProspects.com headquarters that Digital Correspondent Jonathan Singer has been promoted to Senior Correspondent. Congratulations, Jon. Photo Credit: Jackie Bradley and Simon Mercedes by Kelly O'Connor.